Come and find out how to build your own indoor Barn Owl nestbox from a recycled tea chest. What is a ‘Nestbox Workshop’? Spend a day with us, make your own indoor Barn Owl nestbox to take away; visit a farm, and receive a comprehensive Barn Owl information pack! A nestbox workshop is a one-day event run in conjunction with your group such as a county Farming and Wildlife Advisory Group or Wildlife Trust. Workshops can be held at our lovely base near Ashburton in Devon, on the edge of beautiful Dartmoor – or we can travel to your group’s venue anywhere in the Southwest UK – we have run workshops in Devon, Cornwall, Somerset, Dorset and Gloucestershire, since 1992. We begin with an illustrated presentation about the Barn Owl and its habitat, the value of nestboxes and methods of construction and erection. After lunch you’ll convert a tea chest into a deep indoor Barn Owl nestbox using wood provided. Once the nestboxes are completed, we’ll visit a local farm and demonstrate nestbox erection in both traditional and modern barns. Finally you’ll collect your nestbox to erect in your own home area. Throughout the day there are plenty of opportunities to ask questions, browse through our exclusive owl items to buy, pick up free information leaflets, and enjoy the tea and coffee provided. The workshops are popular with and suitable for all ages, with previous participants from 8 – 80. Children must be accompanied by a responsible adult. If you don’t happen to belong to a local group, there still maybe occasional places available – call us to register your interest. Or why not just get together with a group of friends? How can I book a nestbox workshop? If you would like to find out about future events or if you are involved with an organisation that may be interested in holding one with us, please contact us. There is a charge for these workshops to cover the cost of materials, overheads and a contribution towards staff time. 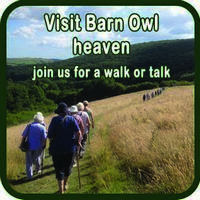 NOTE: Sorry, but there are no live Barn Owls displayed at these events. Event Diary – Join us for Conservation days, craft workshops, walks, talks and more! Buy a purpose built nestbox from us or build your own owl box. Start your own Barn Owl conservation project! All the information you need is in the Barn Owl Conservation Handbook.